I knew little about this enigmatic garden before I went there, and without doubt, it is one of the most astonishing places I have ever seen. Being somewhat intellectually lazy, the temptation for me is not to try to understand it but just to surrender to my emotions, but that was probably one of the intentions of its creator, Vicino Orsini, a 16th century nobleman, poet, philosopher and soldier/diplomat. It is a landscape garden like no other; historians are at odds to explain its meaning. 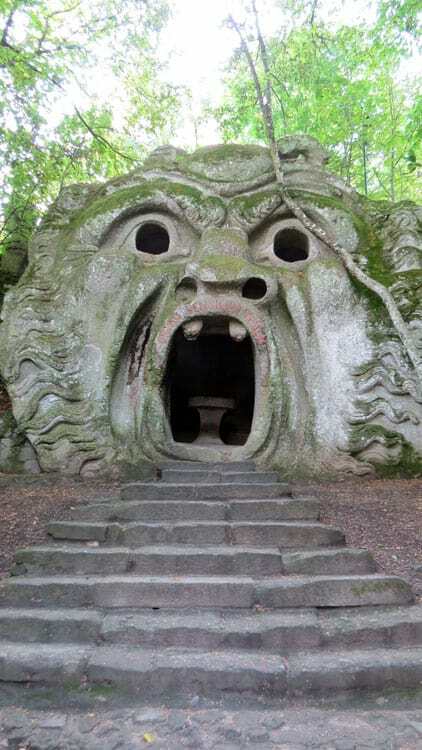 The most famous sculpture is of an enormous head of a man petrified in a scream of terror, his open mouth, large enough to walk inside, being the entrance to the Underworld. The quotation carved on his lips is not Dante’s famous quote ‘Abandon all hope, you who enter here’ but ‘Abandon all reason, you who enter here’, the implication I read as being to let your feelings take charge. It was a visit by the already famous Salvador Dali in 1949 that brought this garden to world prominence, and proved to be a surreal source of inspiration for his future work. 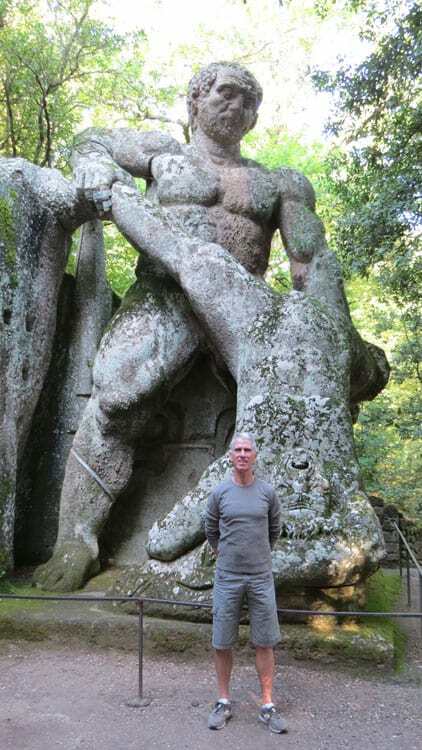 At that time the Sacro Bosco (The Sacred Grove) was rough fields and scrubland; its monstrous sculptures having been left in an abandoned state for over 400 years. 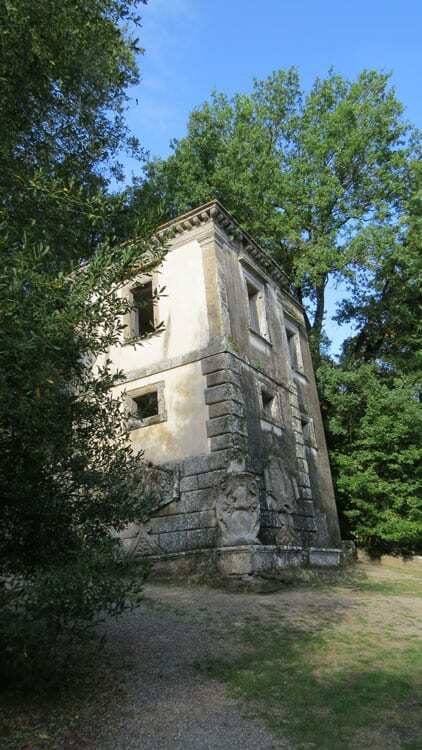 Rescued by the Bettini family, the mammoth task of restoration and of replanting the woodland has been a labour of love. Orsini began the garden in 1552, and eight years later his wife Giulia Farnese died childless, although he was to live on until 1584. 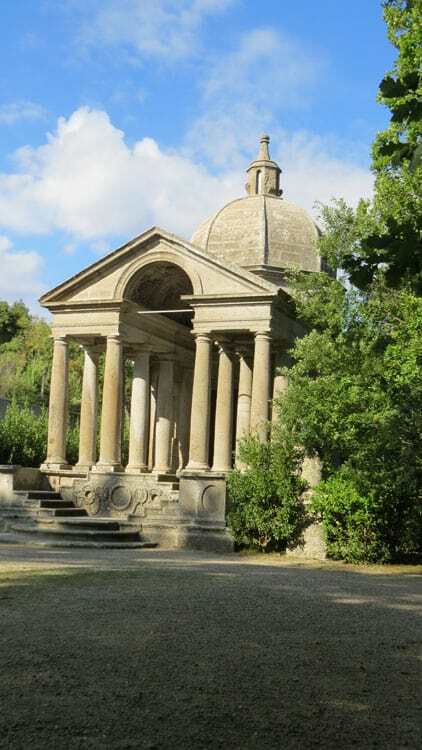 There are references in the garden to Aristo’s poem Orlando Furioso, the story of a hero driven mad by the loss of his wife, and my favoured theory is that the creation of the garden was in part a monumental exercise in self-therapy. 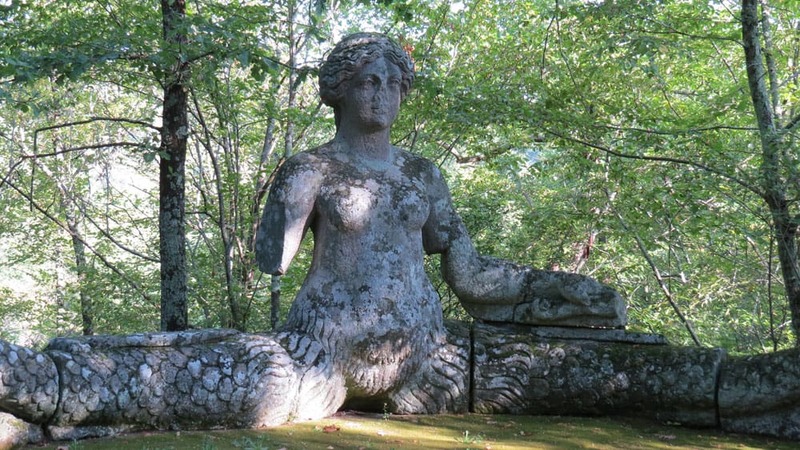 One of Orsini’s other intentions was to challenge the perception of reality, and the most surreal structure in the garden is the Leaning House where the rooms create an instantaneous feeling of nausea; but many of the garden’s sculptures merged their historical references, which gave them the appearance of passing thoughts or dream-like or nightmarish apparitions. 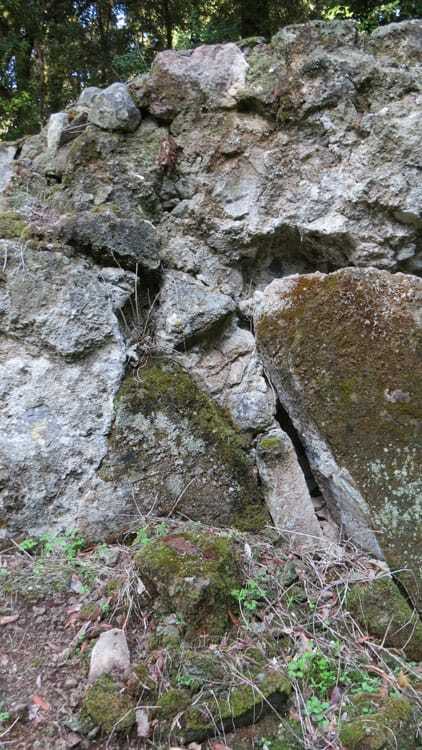 The rolling landscape north-west of Rome around Viterbo is characterised by large rocky outcrops, many of which suggest human and monstrous forms that appear to be violently forcing their way up out of the ground. 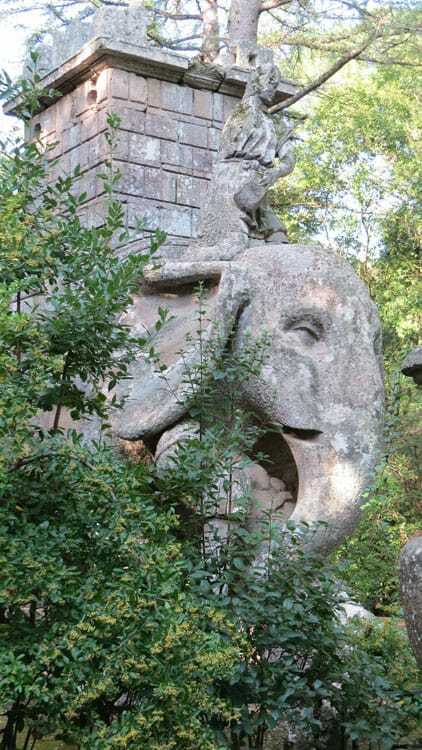 Sacro Bosco’s sculptures were carved in situ from these rock outcrops and seem dotted haphazardly around the garden. Today they are weathered, mellow and mossy which I think gives the landscape a false sense of cohesion; but in the16th century they would have been realistically coloured and would have seemed like startling intrusions. Natural rock formation or altered by man? Post-Freud and Post-Dali, it must be much easier for me to comprehend Orsini’s vision than his contemporaries, who were intent on creating formal Renaissance gardens with a sense of order that appealed to the intellect. 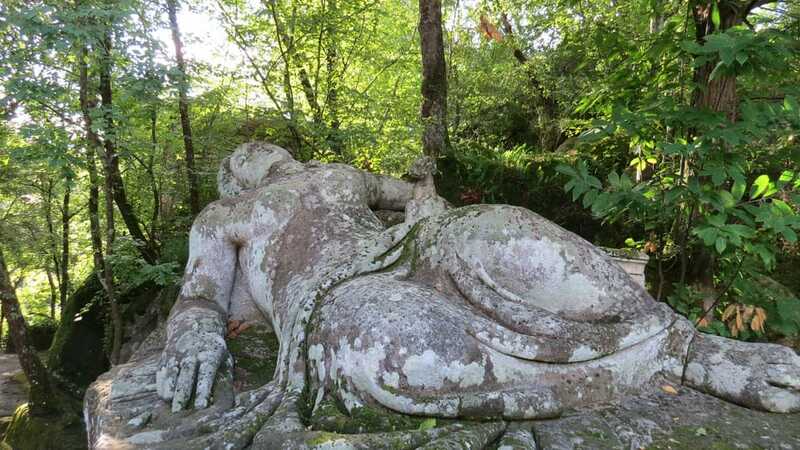 Even for us, the free reign of emotions is heady and dangerous stuff, and Sacro Bosco is a fabulous place, a must-see, for everyone interested in gardens.